Multicomponent Reactions (MCRs) are a promising and vital field of green chemistry. 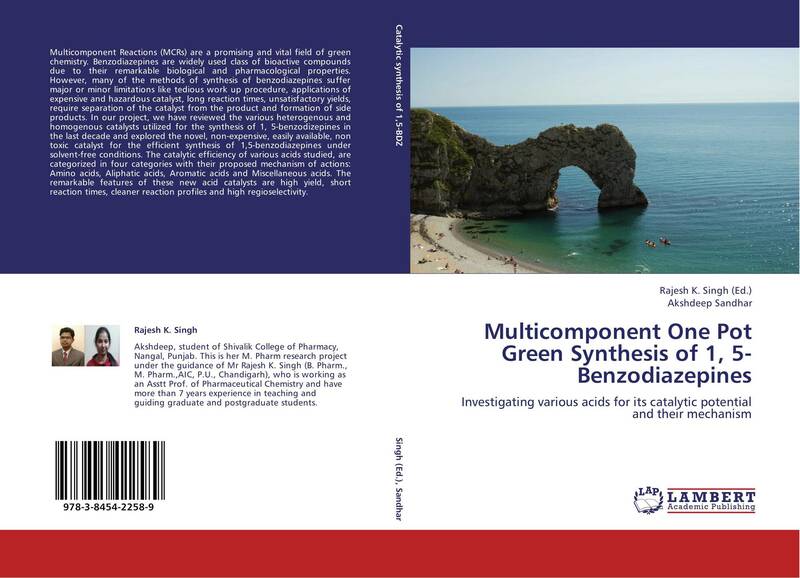 Benzodiazepines are widely used class of bioactive compounds due to their remarkable biological and pharmacological properties. However, many of the methods of synthesis of benzodiazepines suffer major or minor limitations like tedious work up procedure, applications of expensive and hazardous catalyst, long reaction times, unsatisfactory yields, require separation of the catalyst from the product and formation of side products. In our project, we have reviewed the various heterogenous and homogenous catalysts utilized for the synthesis of 1, 5-benzodizepines in the last decade and explored the novel, non-expensive, easily available, non toxic catalyst for the efficient synthesis of 1,5-benzodiazepines under solvent-free conditions. The catalytic efficiency of various acids studied, are categorized in four categories with their proposed mechanism of actions: Amino acids, Aliphatic acids, Aromatic acids and Miscellaneous acids. The remarkable features of these new acid catalysts are high yield, short reaction times, cleaner reaction profiles and high regioselectivity.